I must start this post by saying a huge thank you to all my new followers – I’m amazed – I believe I now have over 250 followers, I hope I don’t let you down!! Right, lets start with the most important thing! Charlie’s health!! He is amazing, he has now decided that he no longer needs the pushchair, can you believe it? He not only walks along on the lead, he is positively trotting!! Personally I think the neighbours cats teased him about being pushed around in a buggy and his pride has taken a tumble!! Either way, I’m delighted that the old boy is once again up on his four paws and enjoying life again. I have still taken the buggy just in case and it’s a real treat to have somewhere to put the shopping, my handbag, camera etc!! Maybe we won’t be needing it though, we’ll wait and see. But just have a look at this photo and ask yourself, is this a happy dog or is this a happy dog? Even though my sister has lived in this French village for over 20 years, we rarely get the time to amble through the back streets and really explore. For once, I’m here long enough to do just that, so with Charlie in tow, we’ve had some lovely walks taking the scenic routes back from the Boulangerie on our daily trip to get the bread. Unfortunately, there are some things that we’ve seen that must remain unshared, as the camera was lying on the dining room table at the time!! Like the incredible sighting of a Kingfisher, that flew all around the lake, givng us an amazing view of his fantastic turquoise undercarriage! Also the little lizard who was basking in the sun until clever boy (Charlie) decided to sniff him, sending the little fella scuttling off into the brick work. Charlie was so excited by this, the following day he pulled snorting and snuffling in the same location looking for his little reptile friend! By far the funniest thing we saw (without the camera) was a fisherman. We were ambling along and in front of us was a man, not a big man, stood on the bank of the lake. As we approached we could see that the line was curved, something was on the end of it. As daft as it seems, I’ve never actually seen a fish being caught, so we stood still and watched from a distance. We waited and watched with interest. The man had a long rod in his right hand and a net on a long pole in his left hand, from what I saw, I believe the idea was that he pulled the fish in close with the rod, positioned the net under the fish and whipped it out of the water, sounds easy enough. Well trust me, the fish had other ideas, I wasn’t sure what type of fish it was but it was not giving in easily – in the words of Richard Dreyfus in Jaws “We’re gonna need a bigger boat!” I swear I thought there was a shark on the end of the line. The man struggled, at one stage he even held the rod between his legs while he attempted to get the net under the flapping fish, this in turn made him unsteady and my sister and I grabbed on to one another giggling thinking, this is it, he’s a goner, he’s going to go in with the fish!! His fold-up chair was just a few inches behind him and we could see the whole situation unravelling before our eyes, Oh blimey, what if he falls in? Do we go and save him? As luck would have it, we were saved from that dilemma, as he eventually managed to get the scaly beast out onto dry land. We clapped and congratulated the man. He was delighted and told us it was the biggest fish he’d ever caught! It was a carp and a (excuse my French) a bloody, big carp! It would easily have fed a family of 6! It was ugly, wet, slimy and was slightly pink, apparently called a Golden carp. So there you go, he put the fish back in the water and it looked stunned to say the least. I’m glad I saw it, although I don’t think I’d like to see it again, if nothing else, it has enabled me to decide that I don’t think fishing is a very nice sport! Agreed, the fish was damn ugly, but I don’t know if I’m right, but it looked distressed and exhausted! So not for me I’m afraid. As for things I did have the camera for, a little black goat that appeared to be walking on air! A tiny little stone statue of a girl way up in a nook on the side of a house, beautiful gardens through iron gates and by far the most beautiful scene was the stained glass window in the village church, which was truly stunning. Yesterday, we took a trip out to a local stable. We travelled just a couple of miles up the road and it was as if we were slap-bang in the middle of nowhere. The stables were fantastic with incredible facilities, they even had an electric carousel for exercising the horses. While we were there, a class of young girls and their horses were having a lesson. As a young girl growing up in Wales, horses were probably my biggest passion, in fact I could write a blog just about the exploits my friend and I used to get up to!! Although, now as an adult I have more respect for horse and if anything they do frighten me, they are so big, and you know what? if a horse decides he doesn’t want to do what you want him to do, he has slightly more muscle! So now I just admire them from a distance! I have huge admiration for horse riders especially these young girls who have no fear, just a love of horses. It must be every young girl’s dream to have a pony. 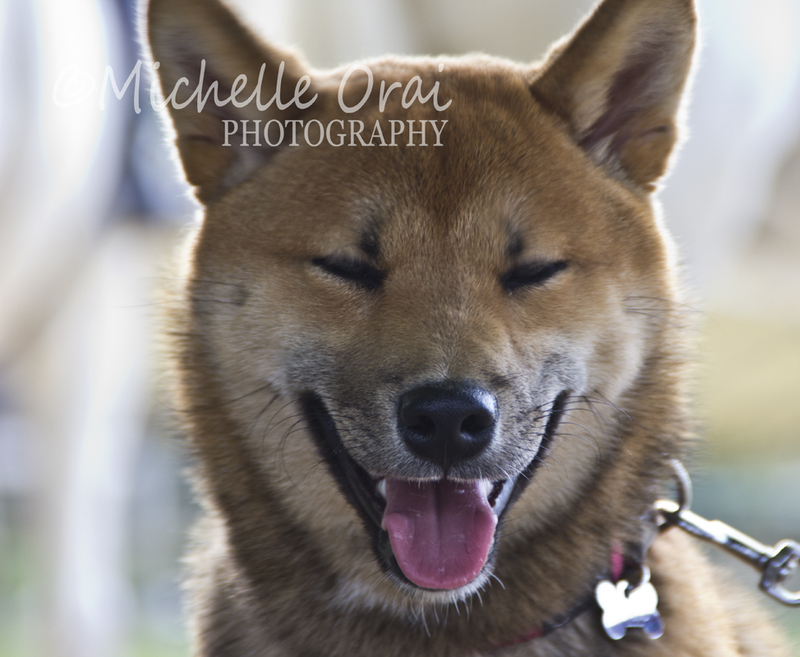 This is a super little six month old Shiba Inu that was at the stables, another smiler. On the Harry front, I’m afraid I haven’t even been to see him over the last couple of days, but next week I’m planning on giving him a spring clean and do some more organising! I think maybe, I should also start applying myself to our itinerary, as we have no firm plans as to where we’re going!! So typically disorganised but feeling very carefree!! This entry was posted in Daily life, Dogs, Hidden Gypsy, motorhome, motorhoming, Photos, Uncategorized and tagged Dogs, Fishing, france, french stables, French Village, hidden gypsy, Horses, Hymer, motorhoming, Smiling dog, stables. Bookmark the permalink. ← There’s life in the old dog!!! I did not know they lizards in France. When I lived in Florida those little lizards were everywhere. Often they’d get into the house, much to the cats delight (although not mine, finding limbless lizards is never fun). The lizards are the only thing I miss from Florida haha! Yes, good old Charlie! They’re only tiny little lizards but very cute. Charlie has a thing for frogs! He searches for them, bites them and leaves them for dead, it’s horrid. I used to find so many frogs with rigamortis on my lawn! Oh, be careful, might want to research if there are any poisonous frogs on your travels then! In Florida there was a particular toad that was poisonous and many dogs wound up paralyzed, some died if not treated in time. Many newcomers to Florida learned too late about those frogs. Florida had little lizards, tiny things, so cute and fast! All different colors, too. Oh I think his frog hunting days are over! Bless him:) but I will check out the French frogs just in case. I’m tempted to make a joke about the French and frogs legs! How delightful you were there to cheer with the fisherman and share the joy of his success. Lovely pictures, as always. There is nothing in the world quite like a relationship with a horse. When an animal large enough to kill you gives you his trust and willingness to cooperate it inspires an indescribable awe. Yes Charlie is more or less back to his usual self, thank goodness! So glad you enjoy my piccies 🙂 I agree with you totally about horses I love them but I think with age I’ve become a lot more prudent and respectful of them!